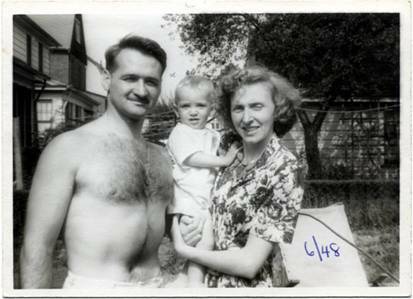 Figure 1 = 4q June 1948, Jack, Adhiratha [Kevin], Wanda [holding 1 yr old A] 194-18 116 Ave., St Albans N.Y.
After reviewing the draft transcript with the advisor for this project, Dr. David Gerwin, I was encouraged to look further at how Jack and Wanda's Lives were different and the various ways the project could be presented to reflect these differences in historical context without taking from the narrative flow. David also suggested that I discuss what changed for me during this process either about my understanding of the time period or of Jack and Wanda as they lived through that time period. How were Wanda’s and Jack’s Lives different from others? Simply put Wanda’s and Jack’s experience was different from others in that they shared their own great adventure at the prime of their lives. They express an awareness of how fortunate they were in having shared this time together and to have come through it with good health and some sense of prosperity. How they were the same. Like so many people of their time, the issues related to the Depression and the World War colored much of what they did. At the time these great concerns were like a background movie that everyone was watching. Some similar textured wallpaper on every room of the shared general consciousness. In some sections there is an expected somewhat traditional gender focus as noted in the introduction [B-01] and explored in Part B-7 for Wanda and & B-8 for Jack. However, a good portion of the interviews reflects on shared experience. Wanda and Jack worked for the same company in the Yukon. Both were accountants? Wanda did choose to drop out of the commercial work world once she had her first child. However, she continued to take on other responsibilities with her community of neighbors while raising 9 children and running a small business. New Information, Perspective or Attentiveness? In considering the interviewing process, I discovered that there were at least four reasons I came away with something new added to my previous experience of Jack and Wanda over 53 years. Some information had never been previously shared in the family discussion context. Therefore, my childhood imagination previously had filled in the untold parts of a story. The initial impressions of what it must have been like to live in that time was now supplemented by the actual accounts which deepened my understanding. The stories had not been shared in a lineal time frame with focus on recorded comparisons to what was transpiring in the wider world [Historical Context]. I was just not paying attention to many incidents’ details during the first 30 years when Wanda and Jack’s stories were initially being shared with family and friends. Wanda pointed out that at that stage all the children were quite preoccupied with their own “adventures”. Finally, I am now almost double the age Jack and Wanda were when they went through the interview reported experiences. In this new “context” instead of seeing them as older than me, I am comparing their perceptions and sense of control over their lives to my own awareness at a similar age. I saw their experience and stories shift to those of 20 and 30 year olds [granted told by 80 year olds] but considered from my 50 year old perspective. Since Jack had been so passionate about supporting the Democrat candidate for USA president Adlai Stevenson in 1952 and 1956, I had been under the impression that Jack had been a life long Democrat. Jack had often told the story of e his Father’s loyalty to his church, his union and his party. I was surprised to find out that Jack had not voted a strict democratic ticket before the Rockefeller Campaign of 1964 which I thought was an exception. The interviews revealed that Jack had voted for the Republican Dewey against Truman in 1952. Wanda had voted for the Democrat, Truman and woke up Jack early in the morning to tell him the results. I was able to find out the inside story about how the conservative right wing of the Republican party put pressure on Loyola College during the 1964 presidential campaign to deny Nelson Rockefeller a voice on the campus. It was obviously an emotional experience for Jack since he was the campaign’s contact with the campus. Even 36 years later it was obvious that Nelson Rockefeller’s understanding and support for Jack in that difficult situation touched my father. Jack and Wanda expressed different views of what it was like for each to come and live in NY. This was instructive. Jack thought it was a bit unplanned but relatively smooth. Wanda found it very tough and missed her family. Wanda even went back to Canada for 3 months with their first child without Jack. I didn't understand the depth of the fight between those who wanted intervention before the Second World War and those who wanted isolation. Also the complexity of decision making that took place and the change of positions as the War Progressed. The interview process helped create a new perspective for me on the disagreement within USA families during the Vietnam war. In some cases the parents had previously been through big national political disagreements on committing troops in different conflicts. Over time they had observed that passions can cool and learned that people [even family] with different political outlooks can still have long term supportive relationships. The interview experience confirmed that those living through the period of the end of the war, were not sure that it was really ending. Therefore in some instances they didn’t feel any less pressure or more sense of security until sometime after the end had really been declared. I was somewhat aware of why and how Wanda and Jack met but the interview filled out the events leading up to the meeting, what it was like to work in the Yukon and how it related to the War effort. I became aware of the confidence and self assurance [assertiveness] that Jack possessed when he first met Wanda as they were discussing an incident related to War Bonds during the first days of meeting. I was impressed with the humorous way Jack told stories even if the joke was on him. For example falling into the icy water twice because he stubbornly refused to accept his colleagues’ assistance. I like basketball and practiced for hours in late grammar school and played on the school team in my 11th and 12th year [High School]. I was tall but not real fast or coordinated. From the interview process I learned that my mother liked basketball and played it for a High School that was feeder team for the Canadian Olympic team. She quit because of the boys making remarks about her legs in the short shorts which were part of the uniform. I believed the USA and Canada were very similar, but possibly since Canada was less industrial I had not considered how the economic conditions might also be similar during the 1920’s. 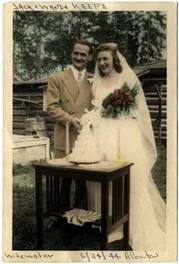 I learned from Wanda’s personal experience of those times that the depression hit Canada as hard as in the USA and that this contributed to why the Davis’ [Wanda’s family] had given up their farm and moved the family to the city. Even though Wanda had no desire to be a nurse, which her father wanted, she worked in hospital for a year to pay off the family's medical bill. Two of Jack’s Brothers [Frank and Tom] were not communicating very well with each other later in life. I was amused to learn that during the War they shared the same hospital room while having minor operations. During their stay, they conspired to trick the football team visiting the patients and were successful to the extent that they were in the local newspaper the next day. I was interested to hear the details of how Jack’s Brother, Frank, defended himself in a military trial. This became one of the many humorous examples of Frank’s keen intelligence. At the same time, in the family’s view, it illustrated his annoying ability to get in and out of trouble. I became aware of how the economics change but that in some ways many of the situations described by Wanda and Jack just illustrate humans trying to figure out the best way to pursue happiness and fulfillment within a given situation. David Kennedy point out that deferments during the war were sought not just to support the war effort in other ways. Some just didn't want to go and were willing to try farm work - which was exempt or even get married and have children which was exempt for the beginning years of the war. [Deferments were coveted, and their distribution traced a rough profile of patterns of political power, racial prejudice, and cultural values in wartime America.] But I also uncovered the interesting fact that 3/4 of those eligible for traditional conscious objector turned them down during the war - going against their religious preference for a fight they felt had to be fought From previous perception it seemed that everyone was part of the War effort. For the past two years I have been reading on the subject and following up some earlier inquires. I have been pleased to be reminded of the long and considered Peace tradition in the United States. It is no coincidence that USA President Woodrow Wilson was such a strong believer in the League of Nations and that NY was selected for the UN Headquarters. I observed the government representatives speaking clearly about the need for intervention by the end of the War and to be a strong advocate for the creation of UNICEF where I have worked for a Quarter of Century. Such a drastic shift from pre WWII public sentiment in just a ten to fifteen year time period is illumining as to how fast some change can come about. US State Depart. report Part B- Section 10. I became further convinced that I was fortunate to have Jack and Wanda for parents. They were both "can do" type of people who had to overcome their own obstacles. They have set an example of maintaining their optimism and dreams of how they can make the world or personal situation a little bit better. Not on the tapes or in Transcript? A number of additional incidents or points for clarification came up as we were reviewing the earlier transcripts. At a certain point I had to stop recording so I could bring what we had thus far to others. This has lead to a number of interesting items not being part of the tape or written record at this point. Jack has more than 75 stories mostly lists of what could be called “often told tales” Some have been recorded in brief from his list but not transcribed. Jack also recorded the beginning of a book he has been considering writing for some time. The early recording of stories was a type of "warming up". They set the stage and helped us progress to some new territory where an active interviewer and interviewee relationship took place. The family - through pictures. Reviewing the pictures of the Keefe family things I see some things differently or more clearly. 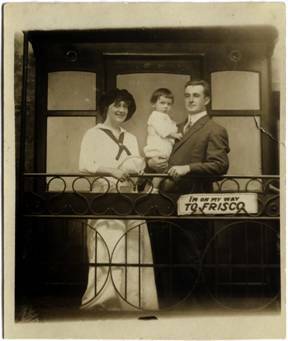 · I see Pop Keefe [Jack’s father] then in his twenties holding his first child. He is with Jack’s Mother [Elizabeth “Bess”] and has a whimsical smile posing on stage set with caboose “on way to San Francisco”. · He is proud in his NYPD uniform. It is different story from Jack’s father reported in the 1987 Sport Illustrated story who had two sons die early and another with polio. 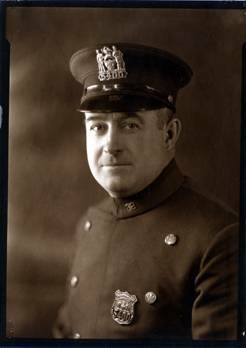 Before seeing these older photos I remember Po Keefe most from two occasions. When we would go to visit the family home in Queens only my Grandfather and Aunt lived there then and Pop Keefe would give us dried fruit that he kept in his bedroom [my mother wasn’t too happy about that]. The other time I remember is once he visited after he had retired to Florida. · I see Wanda’s parents, Stanly and Wilde Davis walking confidently down a street with suits on. They are the grandparents I remember mostly from my earliest days, though they lived mostly in Canada. · But I don’t remember them as city people in suits. Wilde would sit for hours trying to teach me how to speak since I had a bad habit of mispronouncing a few crucial words. My Grandfather Papa Davis I remember whittling us wood whistles and making kites. I also remember him allowing me to watch him work with his hands suing the saw and hammer. Some times, when I was 4 or 5 , Stanley would ask for my help to hold the end of the board he was sawing. It made me so proud and happy to work with him. But in the pictures and stories he is the object of my mothers life: encouraging Wanda to stay with the basketball team; wanting Wanda to be a nurse; heading the highway crew during the depression, moving the family from city to farm to make ends meet and most importantly keeping them all together in a way that the children could still get a good education. Towards the end of his life, I remember visiting Canada briefly one summer  when I was in college. Stan was in pain and confined to his bead after he was released from the hospital. He had been in a accident when his truck was hit by a train one evening. 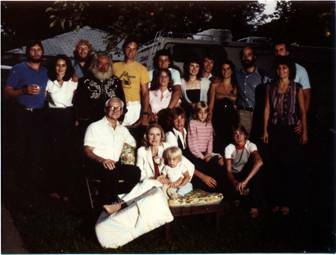 · Jack and Wanda are in the pictures before they knew their children, then they are pictured with a few and finally with the whole nine. It is amazing how they did it. But they both had hard working role modules. 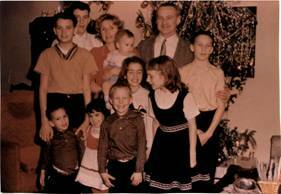 During the interviews I learned that my Popa Davis kidded jack and Wanda when he would see us his grandchildren. He would tell jack and Wanda that their genes worked well together because they had better looking kids than they were. He would illustrate his point by pointing out my parents noses which he said could use some improvement and noting that fortunately the Keefe children didn't have that nose gene. · On looking at a few pictures [eg.1961] I was reminded of the responsibility I assumed at and early age in a large family. · I see the different children in the Keefe family from various years and can only imagine what it was like to come into the family after the first few. But that is another story. Defending Jack or Wanda during the interviews. During the interview I noticed my self trying to defend Wanda or Jack against the other’s views. This I found interesting to observe since it was intense for me. · When Wanda was amazed the Jack didn't express more detail around the children's birth stories, I felt the need to defend Jack’s selective memory. · Jack had often joked about taking Wanda off the farm and putting shoes on her – when they had both met in an office wearing shoes. So once during the interview I mistakenly thought Jack was implying that the people in the Alberta communities were backward or less worthy of serious consideration because they still had outhouses which his neighborhood in NY had not had for some time. However on seeking clarification it became clearer that he was only stating a fact concerning the plumbing systems. Jack Keefe was awarded the Sri Chinmoy Self-Transcendance Award in 1987 which was presented in Jamaica Queens. This current oral history project was inspired by Sri Chinmoy and the activities associated with that award presentation.